Kawah Ijen is the crater of an active volcano on the island of Java, Indonesia. The place attracts local and worldwide tourists, who embark on a journey up the mountain to see the famous turquoise lake and the phenomenon called electric blue flames. Ijen volcano is located in the eastern part of Java, in the direction of Bali. At approximately 2,600 meters above sea level, its crater (kawah, in Indonesian) houses a huge lake with a fascinating turquoise hue, due to the abundant presence of hydrochloric acid in the water. But the great show of colors there is given by flickering blue flames spouting from within the mountain, as if they were blue lava - in fact, the phenomenon is nothing more than the combustion of sulfuric gas that comes in contact with the air, creating explosions of blue flames. To visit Ijen, you have two options. With the first one, you need to start the tour at 1 am when it is still dark. The tour agency will pick you up at the hotel with a jeep and take you to the trail entrance to face the 3-kilometer climb (which takes about 1h30, depending on your fitness level) to catch the blue flames. When reaching the top, after the walk, it is necessary to descend about 800 meters to the bottom of the crater, where the phenomenon happens. As the path is stony and uneven, it is necessary to pay extra attention - it is recommended to hire a guide to go down with you. The blue lavas can be seen until about 5 am and the sun rises at approximately 6 am; because of this, you will probably see the sun rising in the crater and not at the top of the volcano. But since you will be very close, if you can withstand the smell of sulfur, you can get close and contemplate the beauty of the lake (but never touch the water). With the other option, you can start a little later at 3:30 am at the hotel. The path is the same, but the difference is that you do not descend to the bottom of the crater and see the blue lavas from the top of the volcano. You will climb straight up and stand on the ridge, waiting for the sun. It may seem less impressive, but it is not: it is an incredible spectacle to watch dawn break coming in and illuminating the other volcanoes around. After the sun appears, you can see the sulfur smoke coming out of the mountain, like a huge pressure cooker. Sunlight will slowly reach the crater, and the lake will change from gray to vibrant blue. The mist gives an ethereal aspect to the place, and is completely dissipated when the sun reaches its apex. After choosing one of the tour options, it's time to decide whether to do it with or without the guide's assistance (I preferred to wake up later and do the tour without a guide and I do not regret it). Banyuwangi is the nearest town for those who intend to go to Kawah Ijen. Many agencies in the city sell the jeep tour to the beginning of the trail for about 400,000 IDR. To get to Banyuwangi, it is possible to fly from Jakarta and Surabaya to the local airport. If you are planning to visit the volcano from Bali, you can catch a ferry at the port of Gilimanuk, on the western part of the island, to the port of Ketapang in Banyuwangi. The cost is 6,500 IDR and the trip takes about 45 minutes. There is also the option of taking a tour directly from Bali, but I believe it to be quite tiring. Coming from Surabaya, Indonesia's second largest city, in addition to plane, you can embark on a 7-hour train journey. The ticket can cost from 56,000 IDR in economy class. A quiet hotel, surrounded by trees and overlooking the Strait of Bali and north of the Island of the Gods. There are only 5 spacious rooms and some even have an outdoor shower. The pool is large with sun loungers and sofas to accommodate guests. They also house a Javanese-style restaurant serving Indonesian food and some international dishes. All tours can be booked with them. Another option for those planning to visit Kawah Ijen, the Ketapang Indah is close to one of the region's volcanic sand beaches. It has a much larger number of rooms than Bangsring and has a larger infrastructure and facilties. The temperature drops a lot at night, reaching 5 °C, so have winter clothes with you - a fleece, a windbreaker and hiking boots should be in your suitcase. (I saw many tourists in running and training shoes, but I do not recommend it, especially if you're going to see the blue flames at the bottom of the crater.) As soon as the sun rises, it is common for a dense fog to cover the lake, so spend more time waiting until it is completely clear. I hired a car with a driver at my hotel to go to the start of the trail. There are several guides offering their services, which is not mandatory, but they have the knowledge of the area to indicate you the best spots to see the lake and sunrise from a more suitable angle. When hiring the tour, ask if they will provide you with flashlights and masks, or if you should arrange it. I did not need a mask, but the flashlight was used all the time in the dark. 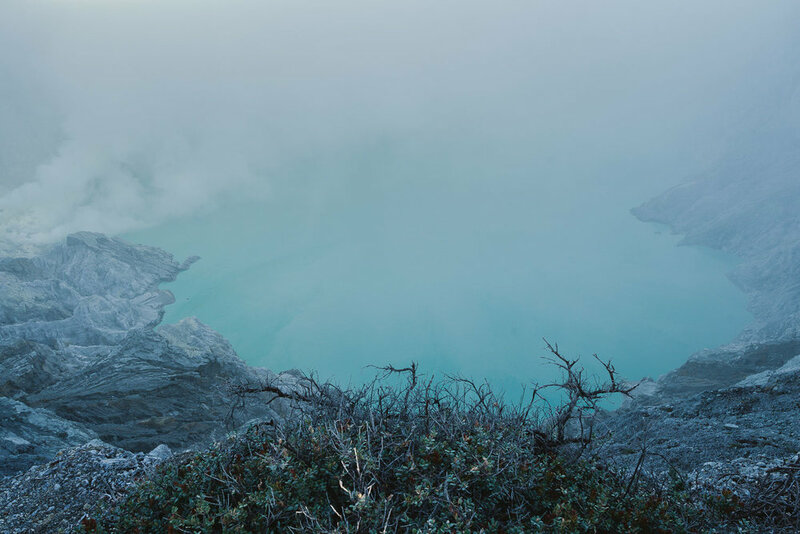 So, would you like to visit Kawah Ijen?